Molissa Fenley and Bob Holman present The Cutouts, (Matisse) a collaboration of dance, poetry and music. Molissa joins with Douglas Dunn + Dancers and Jody Oberfelder Projects to present a showcase as part of the APAP conference. Molissa, with company members, Christiana Axelsen, Jared Brown, Betsy Cooper, Holley Farmer, Kristen Foote, Elisabetta Minutoli and Timothy Ward dance Cosmati Variations and Mali. Examining the work of Fabián Barba, Christian Comte, Molissa Fenley, Carolee Schneemann, Jason Akira Somma and Richard Move's Martha@The1963Interview. Peiling Kao dances Artifact as part of her 6th home season of Peiling Kao Dances. Also on the program, choreography by Betsy Fisher (HI), Christy Funsch (CA and NY), Ming Shen Ku (Taiwan) and Hope Mohr (CA). Michael Mersereau and Molissa present Attic, one of the videos created for Archeology in Reverse at the Fagelbo Film Festival. Jared Brown, Molissa Fenley, Giada Ferrone, Ananda Gonzalez and India Gonzalez dance Mix and Artifact as part of the Fridays at Noon series. Also on the program: Claire Porter and Megan Williams. To purchase tickets for this event please click here! Program: Archeology in Reverse created in collaboration with Catherine Wagner. Four site-specific dances choreographed by Molissa are realized on video by Michael Mersereau. Archeology in Reverse features a series of immersive site-specific installations and photographs developed by Catherine Wagner. Working with architecture firm modem (Nicholas de Monchaux and Kathryn Moll) Archeology in Reverse highlights the architectural space of the Museum through sculptural installations, site-specific interventions, photographs and documentation of site-specific choreography by Molissa Fenley realized on video by Michael Mersereau. To view the video please click here! Please join us for the opening reception on Saturday, September 8th from 5-7pm. To RSVP please click here! Richard Move presents on The Floor Dances (1989, revival 2013) as part of Contra: Dance and Conflict at this year's meeting of the Dance Studies Association Conference in Valletta, Malta. The Floor Dances, choreography by Molissa Fenley, music by Henryk Gorecki, sculpture by Richard Long. Program: Their Mark, an evening of new dance and new music, created in collaboration with composers Frank Cassara and Ralph Farris. Their Mark, an evening of new dance and new music, performed live by Frank Cassara (percussion) and Ralph Farris (viola). Composers are Frank Cassara, Ralph Farris, Tigran Mansurian and Andrew Toovey. Performed by Jared Brown, Betsy Cooper, Holley Farmer, Molissa Fenley, Giada Ferrone, Kristin Foote, Ananda Gonzalez, India Gonzalez and Timothy Ward. Mix with sound by the dancers: footfalls, claps and sand-blocks concludes the evening. Molissa performs Artifact (from Archeology in Reverse, 2018) as part of a benefit performance to raise scholarship money for this summer's Toscana Dance Hub in Florence, Italy. Also on the program: Jared Brown, Jennifer Chin, Daniele Del Bandecca & Martina Gregori, Ai Isshiki, Eilish Henderson, Riana Pellicane-Hart and Julie Seal. Molissa curates the eighth annual Molissa Fenley and Friends as part of the free events of Bay Area Dance Week, 2018. This year's artists are Molissa Fenley, Garth Grimball, Erik Lee, Joslynn Mathis-Reed, Bhumi Patel and Adrienne Swan. Reserve your free ticket here! Molissa Fenley and Company performs the reconstruction of Geologic Moments with music by Julius Eastman as part of The Kitchen's celebration and retrospective of his music. Geologic Moments was commissioned by and premiered at the Next Wave Festival at the Brooklyn Academy of Music in 1986. Performed by Christiana Axelsen, Jared Brown, Molissa Fenley, Ananda Gonzalez, India Gonzalez and Peter Kyle. Molissa creates a new work in honor of artist Elizabeth Murray for the closing festivities of the exhibition, Elizabeth Murray: Painting in the 80's. Accompanied by highlighted text by Elizabeth Murray from her copy of “Tractatus Logico-Philosophicus” by Ludwig Wittgenstein as read by Joanne Akalaitis. Performed by Molissa, Jared Brown, Ananda Gonzalez and India Gonzalez. The repertory group of Mills College Dance department perform Mix. Molissa with company member Christiana Axelsen perform four works from the recent repertory with live music performed by Frank Cassara and David Harding. Mix performed by Casondra Bueche, Cindy Heen, Cylie Kindvall and Jordan Wanderer. Molissa and Holley Farmer perform Sargasso Sea as part of an evening presented by the American Dance Guild at the Ailey Citigroup Theater. The dancers of the Toscana Dance Hub: Celine Abdallah, Jared Brown, Darina Eid, Yasmeen Enahora, Lily Gelfand, Eilish Henderson, Erica Isakower, Victoria Ralston and Nicole Truzzi, perform the Florence version of Amdo in an outdoor setting at the Castello Aragonese as part of an evening of dance presented by ExOrto Danza and Toscana Dance Hub. The dancers of Toscana Dance Hub: Celine Abdallah, Jared Brown, Darina Eid, Yasmeen Enahora, Lily Gelfand, Eilish Henderson, Erica Isakower, Victoria Ralston and Nicole Truzzi, perform the Florence version of Amdo as part of an evening of dance presented at the Bargello Museum by the Florence Dance Festival. Program: Duet program with Christiana Axelsen: Patterns of the Surface with music by Tigran Mansurian; Sargasso Sea with music by Andrew Toovey and Mali with music by Laetitia Sonami. The program concludes with Mix. Molissa presents a duet program with company member Christiana Axelsen: Patterns of the Surface with music by Tigran Mansurian; Sargasso Sea with music by Andrew Toovey and Mali with music by Laetitia Sonami. Our program concludes with Jared Brown and Giada Ferrone joining us to dance Mix. Program: Molissa is in residence at the Toscana Dance HUB. She will be setting Amdo on the dancers of the HUB whom will perform the work in Firenze on July 22 and in Agripoli on July 23. Please join us for a free showing of work that will be presented at the Florence Dance Festival this July. Mix, danced by Christiana Axelsen, Jared Brown, Molissa Fenley and Giada Ferrone, and Mali , danced by Molissa, will be shown. Mix, performed by Cindy Heen, Cylie Kindvall, Jordan Wanderer and Anna Zaugh. Mix, performed by Kristen Bell, Rebecca Chaleff and Molissa Fenley for Visual Performance in Museums and Art Spaces. Program: The seventh annual Molissa Fenley and Friends presented as part of Bay Area Dance Week. Works by Molissa, Garth Gimball, Erik Lee, Adrienne Swan and Jordan Wanderer. Molissa performs Mali as part of the Ebb and Flow Dance Alumnae Concert. Molissa and Bob Holman collaborate on Rue Surf, in celebration of the exhibition, New Wave, paintings by Roy Fowler at the Fort Gansevoort Gallery. This is a repeat performance of the premiere presented November 12th. Bob Holman and Molissa collaborate on a new work to celebrate the exhibition New Wave by Roy Fowler. Program: Duet program with Christiana Axelsen with live music performed by Frank Cassara and Ralph Farris. Rebecca Chaleff performs State of Darkness and Molissa performs Mali as part of the inaugural performances of the re-opening of the Roble Art Gym and Theater complex at Stanford University. Molissa and Christiana present an afternoon of work to the dance department at NYU Tisch School of the Arts, admission through invitation only, please contact Molissa. Molissa and Christiana present Entrance and parts of Water Table: Sargasso Sea, The Pattern of the Surface and Mali. Molissa and Christiana are in a residence at The Dance Barns in Santa Fe. Performances of Entrance and parts of Water Table will be presented along with master classes and an open rehearsal working period with visual artist Robert Gaylor. Dates of events to be announced. Molissa, Christiana and Becky perform The Third Coast (parts 1 and 2) and Mali (part 8) of Water Table on a shared program with Elisa Monte, Jennifer Muller and Margo Sappington. Program: Molissa Fenley and Friends, Diane Frank, Garth Grimball and Heather Stockton, Sophia Klein and Adrienne Swan, Joslyn Mathis Reid. Free Performance. Molissa curates an evening of performances as part of the Bay Area Dance Week's Free Events. Molissa will present two parts of Water Table: Amdo performed by Kristen Bell, Rebecca Chaleff and Peiling Kao and Mali performed by Molissa. Program: Ideas about Space - The Dance of Molissa Fenley at the Anderson. Free performance. Molissa and company members Christiana Axelsen and Rebecca Chaleff present dances from Water Table. Joining us for this concert are guests Margaret Cromwell and Peiling Kao. Molissa and company members Christiana Axelsen and Rebecca Chaleff present dances from Water Table. Joining us for this concert are guests Gina Bonati, Margaret Cromwell, Aisan Hoss, Peiling Kao, Sophia Klein, Mackenzie Pierson and Adrienne Swan. Andre Lepecki and Molissa introduce the book Rhythm Field: The Dance of Molissa Fenley. Contributors to the book: Molissa, Stephen Greco, Bill T. Jones, Richard Move and Elizabeth Streb read from their essays. Molissa, Becky and Chris present an evening of work in a salon performance organized by Dianne Vapnek in Santa Barbara. Molissa with Christiana and Rebecca present sections of Water Table in an open rehearsal format. Free. Program: Molissa in a two-week residency. A two-week residency at Yaddo. Molissa will complete the choreography for Water Table and begin the research for a new work. Molissa creates Amdo, part 7 of Water Table for the Barnard/Columbia dance department as part of their series Barnard/Columbia at New York Live Arts. Original score by Ulfur Hansson. Program: Book Party for Rhythm Field: The Dance of Molissa Fenley Molissa, Richard Move, Paz Tanjuaquio and other guests read their essay. Molissa and Ann read from Rhythm Field: The Dance of Molissa Fenley. Printed by Seagull Press, part of the Enactments series edited by Richard Schechner, distributed by the University of Chicago. Christiana and Molissa present On the Other Ocean and Entrance, both with music by David Behrman. Also on the program, a section of Energizer will be performed by the repertory workshop participants. Molissa Fenley and Christiana Axelsen are in residence teaching Energizer to company members of RDT. Program: Free Event as part of Bay Area Dance Week: Molissa Fenley and Friends - featuring the work of Molissa Fenley, Garth Grimball, Wanjiru Kamuyu, Katherine McGinity, Cuauhtemoc Peranda, Mackenzie Pierson and Adrienne Swan. Molissa curates an afternoon of performances as part of the Bay Area Dance Week's Free Events. Please make a reservation on Brown Paper Tickets. Seven was commissioned by Dana and Shinichi Iova-Koga as part of their series, 95 Rituals, dedicated to Anna Halprin. Becky, Christiana and Molissa present new and reconstructed work in an afternoon performance at Stanford University. Becky, Christiana and Molissa present three works in the Mills Art Museum. Performance is at 2pm and free. Keith Sonnier exhibits a new body of work, Stock Props, originating from designs for Molissa's Prop Dance #5 (2010). On view from January 13 to March 1, 2015. Christiana Axelsen and Molissa present Entrance as part of Marie-Christine Giordano Salons. A free event where the audience is invited into a conversation after the performance. Reservations are necessary: please reserve your place here. Program: Entrance, premiere, performed by Christiana Axelsen and Molissa Fenley with music by David Behrman. Christiana Axelsen and Molissa premiere Entance on an evening at The Flea curated by Nina Winthrop. Also on the program, works by Amanda Loulaki, Roxanne Steinberg and Nina Winthrop. Christiana Axelsen, Rebecca Chaleff, Molissa Fenley, Evan Flood, Matthew Roberts and Stephanie Salts dance an evening of new and reconstructed work. $100 for the performance and reception to benefit the Momenta Foundation. Molissa, Christiana Axelsen, Rebecca Chaleff, Evan Flood and Matthew Roberts perform Dance an Impossible Space with music by Erin Gee and set by Roy Fowler, as part of the Bogliasco Foundation's annual presentation at Lincoln Center. Free. Christiana Axelsen, Rebecca Chaleff and Molissa Fenley perform the trio version of Dance an Impossible Space as part of Dance at Socrates curated by Julia Gleich and Jason Andrew at Socrates Park. Free. State of Darkness is performed by Jonathan Porretta on the Inside/Outside stage at Jacob's Pillow. Molissa creates a new work, Redwood Park, for the Oakland Ballet as part of their "Oakland-esque" Program. Original music composed by Joan Jeanrenaud and performed live by Nava Dunkelman and Anna Wray. Molissa curates an afternoon of dance as one of the closing events of Bay Area Dance Week. This year's curation of Molissa Fenley and Friends includes performances and choreography by Holley Farmer, Molissa Fenley, Peiling Kao, Cuauhtemoc Peranda, Jose Navarrete and Debby Kajiyama. On the final concert of the season, RDT continues to explore “a sense of place.” Choreography by Molissa Fenley (“Desert Sea”), Zvi Gotheiner (“Erosion”), Joanie Smith (“Turf”) and Ze’eva Cohen (“Rainwood”) will pay tribute to the gorgeous landscapes surrounding us. Utah’s red-rock landscapes, its wetlands, forests and mountains give inspiration to an unforgettable concert. Molissa and Alvin Curran collaborate on an event with musicians and dancers responding to instructions of movement and sound to fill the space of the Mills College Art Museum. Performed by Molissa Fenley and Company members: Christiana Axelsen, Rebecca Chaleff and Peiling Kao with 10 dancers from the Mills College Dance Department. Free. State of Darkness returns to the Pacific Northwest Ballet's repertory as part of Director's Choice. Performed by Angelica Generosa, James Moore, Jonathan Porretta and Matthew Renko in alternation. A public performance of Ito’s work is scheduled for Wednesday, March 12th, at the JACCC’s Aratani Theatre at 7:30 p.m. LEGACY: Homage to Michio Ito also features choreography (dating from 1920 to 2005) by Ruth St. Denis, Ted Shawn, Doris Humphrey and Molissa Fenley, all of whom--like Ito--worked in California, and changed the landscape of modern dance in America. Produced by Carlota Schoolman and directed by Tom Bowes, Two Moon July features an eclectic array of video, film, visual art, performance, and music compiled in clips to form a 60-minute montage celebrating the Kitchen's 15th anniversary. Bowes created the production by cropping and sampling footage from video and film works as well as recordings of multiple durational performances, many taped in The Kitchen's former SoHo location. The space had been specially outfitted for the recording as an outré, hot-lit theatrical stage with installations by Jonathan Borofsky, Brian Eno, Robert Longo, and Cindy Sherman, which appear in the final production. The compilation opens with a clip of Laurie Anderson performing Difficult Listening Hour, in which the artist delivers an introduction to a fictional radio show. In a snippet from David Byrne's Report from LA, the Talking Heads frontman frantically recites titles of real and imagined movies that he can't wait to see. Short segments of film and video works by Michel Auder, Dara Birnbaum, and Bruce Conner, among others, are interspersed with Bowes' selections from the taped performances, a list which also includes Molissa Fenley, Bill T. Jones, Philip Glass, Arto Lindsay, and John and Evan Lurie. The production, in retrospect, reads like a prescient compilation of works by artists who would become icons of their time. Molissa shows recent works in a studio showing for APAP/NYC 2014 - Association of Performing Arts Presenters as part of the 57th annual global performing arts conference and marketplace. Pacific Northwest Ballet is remounting State of Darkness for performances next March 2014. Molissa works with Rachel Foster, James Moore and Jonathan Porretta for the week in preparation. Molissa performs a new work Dance an Impossible Space in collaboration with visual artist Jean-Pierre Giovanelli, a fellow colleague of The Bogliasco Foundation. Molissa will begin the research and thinking that precedes and accompanies the choreography of a new work at this fellowship in Italy. In thinking about what a new work will involve/ source/ create, Molissa will invariably return to the presence of the sculptural body in both ancient Roman and Greek art. The sense of the continuation of the human form from the ancient world to our contemporary time is always an inspiration for her to explore new movement and dance phrasings. The revival of Desert Sea, commissioned by Repertory Dance Theater in 2004 with music by Lou Harrison, is performed as part of RDT's tour to Cedar City, Utah. Repertory Dance Theater is remounting Desert Sea for performances in November. Molissa works with the 8 dancers of the company for two days in preparation. Program: Found Object (premiere) with text by John Guare, Joy Harjo and Rudy Wurlitzer, music by Erin Gee. Energizer (1980), for 4 dancers, with music by Mark Freedman. The Floor Dances (1989) with music by Henryk Gorecki and sculpture by Richard Long, performed by Molissa Fenley. Witches' Float (1993) with music by Alvin Lucier and sculpture by Kiki Smith, performed by Holley Farmer. Performed by Christiana Axelsen, Rebecca Chaleff, Holley Farmer, Molissa Fenley, Peiling Kao, Cassandra Neville and Rosemary Quinn. Program: Molissa teaches a 5 day repertory workshop and performs in an informal performance on Thursday 9/12. Molissa performs Horizon in honor of friend and artistic collaborator Jene Highstein. Molissa performs Horizon in honor of one of her first teachers, Mary Ann Kinkead. Program: Rebecca Chaleff, Molissa Fenley and Peiling Kao dance a variation of Found Object with sound by Michael Mersereau. Molissa performs Horizon with music by Pauline Oliveros. An afternoon of contemporary dance curated by Molissa Fenley. Featuring works by Mills alumni and visiting New Yorkers: Margaret Cromwell, Molissa Fenley, Diane Frank,Katherine McGinity, and Cuauhtemoc Peranda. Molissa performs Horizon with music by Pauline Oliveros. Venue: Panel discussion about "State of Darkness"
Program: Molissa visits University of Wisconsin-Madison's Dance Department for a panel discussion about "State of Darkness." This exhibition, the first of its kind to exclusively showcase the dance archive of the Brooklyn photographer Julie Lemberger, features 80 photographs chronicling twenty years of New York's famed dance makers, dancers, and dances from the early 90s to today, also featuring photographs of Molissa Fenley. A special exhibition honoring the hundred year anniversary of Le Sacre du Printemps, or The Rite of Spring. This project will explore the history of Nijinsky’s original production, Stravinsky’s groundbreaking score, and the many outstanding variations produced by choreographers and dance companies worldwide. The exhibition will include profiles on each different production of The Rite of Spring, including Molissa Fenley's State of Darkness. Molissa and Peiling perform Haunting, a new work created for Hung Liu's exhibition at the Mills College Art Museum. Visit http://mcam.mills.edu for more information. Molissa performs as part of the performance series at the Museum of Arts and Design, curated by Valerie Gladstone. Molissa and Peiling perform Cosmati Variations and Work in Progress (Found Object). Program: About Cage on Vinyl on Marley, organized by Norte Maar in association with Experiments in Art and Technology (E.A.T) and the National Academy Museum. Molissa participates in the day-long durational Cage Transmitted Event by contributing 15 minutes of work. This historic event features a number of New York City’s great dancers and choreographers performing to vinyl recordings of John Cage’s music. Performances begin in the morning as the Museum opens, 11am, and continue throughout the day until closing, 6pm. Molissa performs twice, at 2:45pm and again at 3:45pm. Molissa will set a work on the students as well as offer classes. Molissa performs as a guest with the Mills Repertory Dance Company in Event with Canfield. Original choreography by Merce Cunningham reconfigured by Holley Farmer. Program: Dancing in the Museum, a panel discussion presented by the Dance Discourse Project. The Dance Discourse Project discussion series, a project of Dancers' Group and CounterPULSE, aims to articulate what is happening in contemporary Bay Area dance and beyond. Molissa was asked to respond to some of their questions on the topic of visual art and dance; her answers will be presented by Emily Hite. Program: Credo in Us with music by John Cage and The Vessel Stories with music by Philip Glass. The company presents a performance on the outside stage at Jacob's Pillow as part of the Inside/Out Series. For information, please visit http://www.jacobspillow.org/festival/insideout-schedule/index.php or call 413-243-9919. Program: An evening of solo works, "Four dance solos in one hour" with choreography by Jonah Bokaer, Molissa Fenley, Roxanne Steinberg, and Nina Winthrop. Molissa shows a new solo work, Found Object. Program: The Vessel Stories with music by Philip Glass, String Quartet #4 (Buczak), performed by Crystaldawn Bell, Norma Fong, Josie Garthwaite Sadan and Katherine Wells of Robert Moses' Kin. Robert Moses' Kin launches The By Series, a new choreographic commissioning project, which this year features works by guest choreographers Molissa Fenley, Sidra Bell and Ramon Ramos Alayo. Program: A choreography workshop with Molissa Fenley and other innovative voices in dance, open to the public and students at Marymount Manhattan College. Molissa Fenley participates in ChoreoLAb, a summer dance workshop featuring renowned choreographers. For information, please call the dance department at Marymount Manhattan, 212-774-0740, or visit http://marymount.mmm.edu/study/programs/dfpa/dance/summer.html for an online application. The Wisconsin premiere of a new documentary, Seven Solos, follows the process as Li Chiao-Ping prepares to perform a concert of seven solos made specifically for her by renowned postmodern choreographers and includes interviews, rehearsal footage and performance clips. With: Bebe Miller, Cynthia Adams, Elizabeth Streb, Molissa Fenley, Victoria Marks, June Watanabe and Heidi Latsky. Venue: The Garage, as part of the Bay Area Dance Week. Program: Molissa, Peiling and Rebecca perform a new work in progress. Program: Molissa, Cassandra and Peiling perform Alcove of Treasures and 100 Vessels (parts 3 and 2 of The Vessel Stories) with music by Philip Glass. Program: 100 Vessels with music by Philip Glass, String Quartet #4 (Buczak). Performed by Molissa Fenley and Peiling Kao. Molissa and Peiling perform as part of an evening presented by the Dance Alumnae of Mills College. Program: The world premiere of Seven Solos, a documentary by Douglas Rosenberg with Molissa's participation in a discussion following the screening. The premiere of a new documentary, Seven Solos, Li Chiao-Ping's Women Dancing Project in 2009. The film follows the process as Li Chiao-Ping prepares to perform a concert of seven solos made specifically for her by renowned postmodern choreographers and includes interviews, rehearsal footage and performance clips. With: Bebe Miller, Cynthia Adams, Elizabeth Streb, Molissa Fenley, Victoria Marks, June Watanabe and Heidi Latsky. There will be a brief talk-back after the screening with Molissa Fenley and Heidi Latsky as well as Douglas Rosenberg and Li Chiao-Ping. Location: The Elinor Bunin Monroe Film Center, Lincoln Center, 144 West 65th Street, New York City. Program: Richard Daniels will screen Volume 2 and Volume 3 of Dances for an iPhone followed by a discussion led by Jacob Pillow's Director of Preservation, Norton Owen including Richard Daniels, Molissa Fenley, David Leventhal, Barbara Mahler, Risa Steinberg and Christine Wright. Program: Planes in Air with music by Joan Jeanrenaud and props by Roy Fowler. Performed by Betsy Cooper and Oleg Gorboulev. 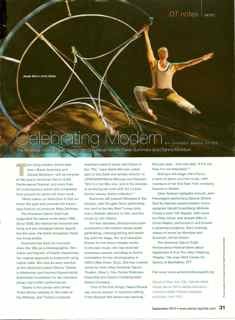 The program includes audience favorites Planes in Air by Molissa Fenley, debuted in SDP’s 2010-11 season, and Edwaard Liang’s To Converse Too and Kent Stowell’s B6, both from SDP’s 2009-10 season. Program: The Vessel Stories, music by Philip Glass and Credo in Us, music by John Cage. Venue: The Art Museum, Mills College. Program: Premiere of Credo in US, performed by Molissa Fenley, Peiling Kao, Cassie Mey, Alyssa Wilmot and Rebecca Wilson, with a chorus of eight current MFA and MA Dance candidates. Music by John Cage performed live by the Mills College Performance Ensemble. In celebration of the inauguration of the incoming new president of Mills College. Three performances at 7:30pm, 8:15pm and 8:45 pm. Free, reservations are required. Please email to inauguration@mills.edu and write RSVP Credo in Us in the subject line. Program: Dreaming Awake, Molissa with Peiling Kao, Philip Glass live on piano; The Vessel Stories, Molissa with Peiling Kao, Cassie Mey and Cassandra Neville with the Youth Orchestra of the Americas performing Glass' String Quartet #4 (Buczak); Provenance Unknown, Molissa with Cassie Mey, Philip Glass live on piano. The Days and Nights Festival, a new festival founded by composer Philip Glass, takes place at the Hidden Valley Institute of the Arts over three weeks in August-September 2011.Saturday evening August 27 at 7:30pm, Sunday matinee on August 28 at 2:30pm. Tickets go on sale starting on April 4, 2011. Program: Molissa and Peiling perform 100 Vessels with a poem written and performed by Bob Holman. On the weekend of July 30-31, Governor's Island came alive to the sound of poetry: it was the first annual NYC Poetry Festival! Three stages and a brothel, hundreds of poets, the air was filled with sass and camaraderie. Now six poets from the event, Lisa Marie Basile, Jassie Harris, Meghann Plunkett, Rita Mercedes, Sarah Feeley, Ayala Sella, Nick Adamski, Bob Holman w/ Molissa Fenley, join forces to continue the energy and raise funds for the Festival and Bowery Arts + Science, the nonprofit that programs the Bowery Poetry Club. A work made in celebration of the 80th birthday of Geoffrey Hendricks. Performed by Molissa Fenley, Cassie Mey and Cassandra Neville with the Philip Glass score, "String Quartet No. 4 (Buczak) performed live by Blue Engine String Quartet. Also on the program: Malcolm Goldstein, violin, "New Music for Geoff"; a sound improvisation conducted by David Martin, master builder; Martie Edelheit, Iron Sheep, 2011 Installed on the NW corner; and Geoffrey Hendricks performing a headstand for his 80th Birthday, 30 July 2011. RSVP to Cloudsmith@aol.com, (212) 431-8625. Molissa curates an evening of new works for the Seattle Threshold Festival - works by Penny Hutchinson, Karin Stevens, Marlo Martin and Khambatta Dance Company join this performance of Planes in Air. Program: 100 Vessels performed by Molissa Fenley and Cassie Mey, music by Philip Glass. Ocean Walk, performed by Molissa Fenley and Cassie Mey and Mesa, performed by Molissa Fenley. Music by Maggi Payne. Molissa Fenley and Cassie Mey perform works in a free outdoors performance. Take the M train to Metropolitan Avenue and walk to 73rd Place. Program: Molissa Fenley and Cassie Mey perform in an art exhibition at the abandoned convent of Saint Cecilia. Excerpts from repertory works are reconfigured for the many different spaces. For more information, please contact Serra Sabuncuoglu at serra007@aol.com. The exhibition includes works by Roy Fowler, Marcia Hafif, Jene Highstein, Ethan Ryman, James Siena, Merrill Wagner, Lawrence Weiner and many others, curated by Serra Sabuncuoglu. The exhibition is open Monday May 17 - Sunday May 22 from 12 to 6 or by appointment. 21 Monitor Street near Richardson Street, take the L subway to Graham Avenue. Molissa Fenley, Peiling Kao and Cassie Mey perform The Prop Dances and Regions. The day before the performance, on March 24th, the company presents an open rehearsal onstage and a master class taught by Molissa Fenley. Box office: 931-221-7379. Program: Pieces of Land with music by Jason Hoopes, props by Jene Highstein, Planes in Air with music by Joan Jeanrenaud, props by Roy Fowler, Prop Dance #5 with music by Lainie Fefferman, props by Keith Sonnier, Mass Balance with music by Cenk Ergun, prop by Todd Richmond. Molissa Fenley, Katie McGreevy and Cassie Mey perform four of the recently premiered The Prop Dances. APAP members and invited guests only, thank you! To reserve, please email to ewallace@bacnyc.org. Program: Flow-Winged Crocodile, a play by Leslie Scalapino, with direction by Fiona Templeton, music by Joan Jeanrenaud, choreography by Molissa Fenley and video by John Jesurun. Molissa performs as a guest dancer and choreographer in Leslie Scalapino's play, "Flow-Winged Crocodile". ODC: 415-863-6606. Program: Regions with music by Maggi Payne, set by Roy Fowler; Mass Balance with music by Cenk Ergun, prop by Todd Richmond; preview of Planes in Air with music by Joan Jeanrenaud, props by Roy Fowler, performed by the Seattle Dance Project. Molissa performs an evening of solo work. Also on the program, a preview of a new duet, Planes in Air, choreographed for the Seattle Dance Project. This work will premiere as part of the Seattle Dance Project's January season. Molissa performs as a guest dancer and choreographer in Leslie Scalapino's play, "Flow-Winged Crocodile". This event is listed on the Dixon Place website as "Belladonna", 212- 219-0736. Molissa Fenley collaborates with five contemporary visual artists to present "The Prop Dances". Roy Fowler, Jene Highstein, Todd Richmond, Keith Sonnier and Merrill Wagner were invited to create a prop(s) that the dancers can either carry or wear. Molissa agreed to accept anything that the artists might come up with, giving her a challenging puzzle to solve with each piece! Each of the five prop dances also features a score by a contemporary young composer. Also on the program, the revival of "Regions" a work from 1995 with music by Maggi Payne and set by Roy Fowler. The Prop Dances are performed by Molissa Fenley, Katie McGreevy and Cassie Mey unless noted. Molissa Fenley with Katie McGreevy and Cassie Mey perform a dance using props created by Roy Fowler. a special event as part of Roy Fowler's painting exhibition and in honor of the 10th anniversary of Topaz Arts. Click here for details. Molissa performs as a guest dancer and choreographer in Leslie Scalapino's play, "Flow-Winged Crocodile". www.poetshouse.org; 212-431-7920. $10 general, $7 students and seniors, free to Poets House members. Molissa Fenley with Kris Anderson and Ashley Johnson perform Inner Enchantments, originally choreographed in 1990 and here reconstructed. Free. Molissa performs part 2 of Dreaming Awake on a gala honoring Philip Glass to benefit Danspace Project, New York. Tickets can be arranged by contacting the Danspace Project. Molissa Fenley curates and participates in a program for the Harkness Dance Festival. Each choreographer will present 20 minutes of work on each program. Program premieres on Friday, March 26 at 8pm and is repeated on Saturday, March 27 at 8pm and on Sunday, March 28 at 3pm. Program: Molissa performs Mass Balance as a guest performer and choreographer with the Hope Mohr Dance Company. The San Francisco premiere of Mass Balance with music by Cenk Ergun and prop by Todd Richmond. Molissa performs her new solo, in collaboration with poet Bob Holman, on an evening with other choreographers. Program: Dreaming Awake, with music by Philip Glass performed live by Regina Schaffer. Molissa appears as a guest on a program of music performed by pianist Regina Schaffer. Free. Tickets are $20, $10 Students/seniors, cash only, at the door, reservations can be made by emailing to Momentafnd@aol.com and typing "Judson" into the subject. Ice, Dew, Food, Crew, Ape - the New York premiere of a work performed twice: once as set to a score by Alvin Curran and then again danced with STEP a poem written and performed live by Bob Holman. This work was created while Fenley was in residence at the Atlantic Center for the Arts, February 2009. Alvin Curran's score was created by his recording the sounds of the Nantucket ship horn against the sound of John Cage's voice reciting the five monosyllabic words of Curran's title. Bob Holman, also in residence at the ACA, watched rehearsals of the work underway, taking notes of phrases said during the choreographic process, directions taken, relationships expressed, movement described. These notes were then translated into the poetic form that is Holman's work. Standing in the middle of the stage and surrounded by the dancers moving through the choreography, Holman is sometimes in close proximity to the dancers, sometimes encircled as the dancers continue through their spatial constructions. Mass Balance - music by Cenk Ergun, prop by Todd Richmond (NY premiere). A solo for Fenley, the work marks the beginning of a new investigation of dances made using a prop designed or suggested by a visual artist. Fenley carries a 10-foot wooden dowel throughout the piece, experimenting with images of balance and weight. "Mass Balance" refers to the difference between the accumulation of snow and the ablation of ice of glaciers. Yearly measurements have shown a disequilibrium caused by global climate change. Cosmati Variations are a series of works that Fenley choreographed while in residence at the American Academy in Rome, February-August, 2008. Each variation is inspired by an aspect(s) of the 11th Century Cosmatesque mosaic pavements present in many of the basilicas and churches in Rome. The inspirations are in terms of design: T-square and serpentine eyelets; in terms of measurement: movements or spatial travel that require three feet; in terms of ardor: demand of execution and in terms of form: triangles nested within squares. Molissa Fenley performs a solo evening. A program of Marfa Live Arts. Entrance by donation, all proceeds go to the artist. For information, please contact Kelly Dalrymple-Wass at (619) 277-0347. As part of an evening of performances and tributes, Kristina Berger, Katie McGreevy and Cassie Mey perform Cosmati Variations 3,4 with music by John Cage. Venue: The Joyce Theater 6 performances cancelled following first night injury.